This is an attempt to present the views of eminent academicians representing different regions of Asia, namely, the Laos – Southeast Asia’s smallest nation with immense natural resources including tropical wood, hydro-electricity, rubber, minerals, and agricultural land, and the progressive Philippines – the third largest English speaking country with its liberalised trade regime in areas of telecom, mining, oil sector and power (us-asean.org) – offer multifarious opportunities for GIS tecnologies to grow. The article gives a glimpse of geospatial scenario of the two ASEAN nations. The main policy document that exists in geospatial domain is the Decree on Surveying, Aerial Photography and Mapping Activities in the Territory of Lao PDR, No. 255 / PM. 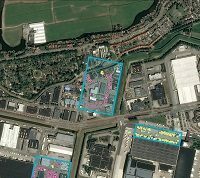 By another policy, Decree No 73/PM, dated 14th July 1994, NGD is given the power to promulgate regulations and supervise surveying, aerial photography and topographic mapping. The Decree states that all surveying activities in Lao PDR, should conform to a single unified system. However, there is not yet a technical instruction on the practical implementation. The Decree also emphasises that all surveying, aerial photography and topographic mapping needs approval from the NGD and after completion of survey projects the results shall be submitted to NGD. Only few organisations have adhered to the Decree that is why it is a cumbersome exercise to get an overview of the geographical datasets available in Laos today. 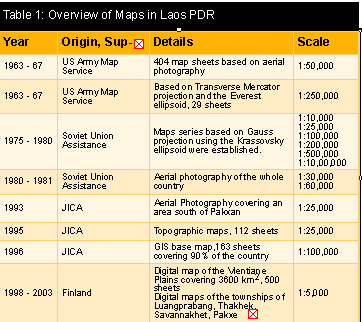 In 1997 Laos got a new geodetic datum with recourses from the Land Titling Project. 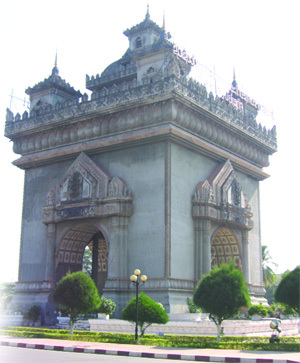 It is referred to as Lao National Datum 1997 and has the origin in Vientiane, Nongteng, Astro Pillar. NGD is recommending all land surveys in the country to use this datum. Recently it has been announced that the STEA will establish a new National Database Centre with support from the Indian Government.